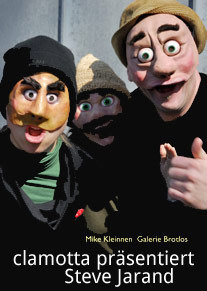 The Canadian Steve Jarand is an expert in Mask Theatre. His figures are deep and emotional and this is the reason why they are so funny. Steves show is a rare performance on his European mask teaching tour. And it is a must-see. Steve and his team give the actors a break and let the masks take the stage. The procceds from the purchase of the tickets go towards the victims of the tsunami-catastrophe in Japan. Der Kanadier Steve Jarand ist der anerkannte Experte auf dem Gebiet des Maskentheaters. Seine Figuren sind tief und bewegend. Das ist der Grund, warum sie so unendlich komisch sind. Steves Show ist eine der wenigen, die er auf seiner Europatournee gibt, und schon deswegen ein must-see. Die Einnahmen aus dieser Show kommen den Opfern der Tsunami-Katastrophe in Japan zu. You like to try mask-theatre with Steve Jarand himself? Try the workshop with Canada’s Mask Performer No1!